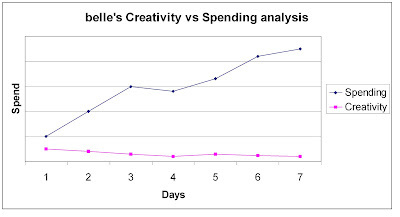 Theory: That the relentless purchase of scrapbooking supplies has a positive effect on creativity. Analysis: As the graph below shows, there is some correlation, but not in the anticipated direction. Spend is trending in a positive direction while Creativity trend is slight negative with a tendency towards an indefinite plateau. It hasn’t all been bad, though. In a rare one-night window of artistic imagination, I made a page with a photo taken at the KISS concert. I tried to make it a little bit grungey and rough, in keeping with the event (or, rather, the crowd), but I couldn’t get away from being kind of naturally neat and structured.